Three men have been found guilty of plotting a suicide attack on an army base in the Australian city of Sydney. A Melbourne court found them guilty of conspiring to commit a terrorist act. Two other defendants were acquitted. 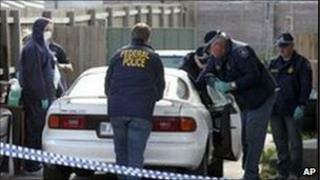 The five men, all Australian citizens of Somali or Lebanese origin, were arrested in Melbourne in August 2009. They were accused of targeting Sydney's Holsworthy military base. Police said the attack would have been the worst in Australian history. The trial began in September and the jury deliberated for more than five days before returning guilty verdicts against Wissam Mahmoud Fattal, 34, Saney Edow Aweys, 27, and Nayef El Sayed, 26. The prosecution said the plot had been hatched between February and August last year, when the five were arrested in a swoop involving hundreds of police. Officials said the men, some of whom had links to Somali-based militant groups, were motivated by a belief that Islam was under attack from the West. They were planning to send a group of men armed with automatic rifles into the base and to keep on shooting until they were killed, prosecutors said. Chief prosecutor Nick Robinson said one of the accused had visited Somalia to seek a fatwa - or religious decree - for the attack. According to a transcript read to the court, Fattal told undercover police: "If I find way to kill the army, I swear to Allah the great I'm going to do it." No date has been set for sentencing so far, but the three men have been ordered back to court on 24 January for an administrative hearing.